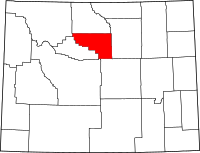 Washakie County is a county in the U.S. state of Wyoming. As of the 2010 United States Census, the population was 8,533. Its county seat is Worland. Washakie County was created on February 21, 1911 with land detached from Big Horn County and organized in 1913. Washakie County was named for the head chief of the Shoshone people, Chief Washakie, who became an ally of the US Government. According to the US Census Bureau, the county has a total area of 2,243 square miles (5,810 km2), of which 2,239 square miles (5,800 km2) is land and 4.2 square miles (11 km2) (0.2%) is water. As of the 2000 United States Census, there were 8,289 people, 3,278 households, and 2,310 families in the county. The population density was 4 people per square mile (1/km²). There were 3,654 housing units at an average density of 2 per square mile (1/km²). The racial makeup of the county was 90.22% White, 0.11% Black or African American, 0.55% Native American, 0.74% Asian, 6.21% from other races, and 2.17% from two or more races. 11.47% of the population were Hispanic or Latino of any race. 27.1% were of German, 13.1% English, 9.9% Irish and 6.2% American ancestry. As of the 2010 United States Census, there were 8,533 people, 3,492 households, and 2,395 families in the county. The population density was 3.8 inhabitants per square mile (1.5/km2). There were 3,833 housing units at an average density of 1.7 per square mile (0.66/km2). The racial makeup of the county was 91.4% white, 1.1% American Indian, 0.6% Asian, 0.3% black or African American, 4.4% from other races, and 2.4% from two or more races. Those of Hispanic or Latino origin made up 13.6% of the population. In terms of ancestry, 33.1% were German, 17.6% were English, 11.7% were Irish, 6.6% were American, and 5.5% were Norwegian. Of the 3,492 households, 30.0% had children under the age of 18 living with them, 56.4% were married couples living together, 7.9% had a female householder with no husband present, 31.4% were non-families, and 27.7% of all households were made up of individuals. The average household size was 2.40 and the average family size was 2.93. The median age was 41.8 years. The median income for a household in the county was $48,379 and the median income for a family was $61,340. Males had a median income of $45,579 versus $30,107 for females. The per capita income for the county was $28,557. About 1.7% of families and 5.6% of the population were below the poverty line, including 1.8% of those under age 18 and 9.9% of those age 65 or over. The Wyoming Department of Family Services Juvenile Services Division operates the Wyoming Boys' School, located in Mc Nutt, unincorporated Washakie County, near Worland. The facility was operated by the Wyoming Board of Charities and Reform until that agency was dissolved as a result of a state constitutional amendment passed in November 1990. ^ Mc Nutt CDP, Wyoming[permanent dead link]. United States Census Bureau. Retrieved on December 12, 2010.